Used to produce transparent, printable, and microwaveable packaging, BarrialoxÂ® SBR2 aluminum oxide-coated polyester film resists pinholing, flex-cracking, and scuffing/abrasion. Thermal stability and such mechanical properties as strength and dimensional stability enable product to withstand converting processÂ conditionsÂ andÂ retort sterilization heat/pressure. Typical value, flat sheet oxygen- and moisture-barrier transmission rates are, respectively,Â 0.01 cc/100 in. and 0.02 g/100 in. Robust, transparent, printable, and microwaveable packaging allows consumers to see the food. North Kingstown, Rhode Island -- Toray Plastics (America), Inc., (www.toraytpa.com), the only United States manufacturer of polypropylene, polyester, metallized, and bio-based films, announces the introduction of Barrialox® SBR2, a new high-barrier, transparent, aluminum oxide-coated polyester film for retort pouch applications, which is made in Japan by Toray's sister company, Toray Advanced Film Co., Ltd http://www.toray-taf.co.jp/en/index.html. 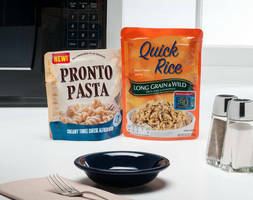 The retort pouch, which is used to package cooked, sterilized food, has gained wide acceptance among consumers who value the convenience of microwaveable meals and "on-the-go" foods. Barrialox SBR2 film offers CPGs and converters a new generation of ALOX-coated film, which has excellent thermal stability and superior mechanical properties, including high-strength and dimensional stability, enabling it to withstand the rigors of the converting process and the intense high heat and pressure of retort sterilization. The film's strength and resilience contributes to the production of a finished, post-retort pouch that has excellent oxygen- and moisture-barrier durability. Typical value, flat sheet oxygen- and moisture-barrier transmission rates for Barrialox SBR2 are 0.01cc/100 in. and 0.02grams/100 in, respectively. Barrialox SBR2 resists pinholing, flex-cracking, and scuffing and abrasion, making it a preferred choice over more delicate aluminum oxide-coated films. In standard laminations, SBR2 is reverse-printed to create a colorful, attractive package that can be microwaved. "Overall, Barrialox SBR2 is an excellent option for gusseted and non-gussetted retort pouch laminations," he says. To manufacture a pouch with added convenience and exceptionally high heat-seal strengths, Barrialox SBR2 can be laminated with Toray's TreaTear® DR72 film. TreaTear DR72 is a directional-tear CPP sealant film that provides an easy, straight tear for opening the package. Barrialox SBR2 can also be used in the manufacture of non-retort clear packaging and in lidding lamination applications. For more information about new Barrialox SBR2 film for retort applications, contact Amanda Whaley, Product Manager, Torayfan Division, at amanda.whaley@toraytpa.com, or 401-667-2023. Toray Plastics (America), Inc., is a leading manufacturer of polyester, polypropylene, bio-based, and metallized films for flexible and rigid packaging, lidding, graphic, industrial, optical, and electronic applications, and polyolefin, polypropylene, and polyethylene foams for the automotive and flooring industries. The company is a subsidiary of Toray Industries, Inc., the world leader in synthetic fibers and textiles, carbon fibers, plastics, chemicals, pharmaceuticals, and high-performance films, which has annual sales exceeding US$19 billion. For more information about Toray Plastics (America)'s complete line of films and foams, contact Mary Gervais at mary.gervais@toraytpa.com or 401-667-2281.Toray Plastics (America), Inc., is located at 50 Belver Avenue, North Kingstown, RI 02852-7500; telephone 401-294-4511, fax 401-294-3410. Visit the Toray Plastics (America), Inc., website at www.toraytpa.com.